Geraldine Rey has led a life that is immersed in music and performance. It is indeed a calling and with that in mind, her new musical venture, G*REY, placing her at the forefront of proceedings whilst transcending her previous band experience, brings Geraldine closer to her music than ever. “I didn’t just want to be that girl playing folk songs with a guitar” she explains. “I wanted to be closer to the music I listen to, rather than the music I was ‘able’ to play with my guitar. That was too limiting." G*REY teams Geraldine with producer Dan Gullaci (Australia’s Best & Upcoming Drummer 2005, touring drummer for Cirque Du Soleil 2006-2011) whom she previously recorded and performed with one of WA’s most popular world music outfits, Mambo Chic. 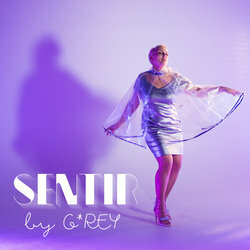 The first fruits of G*REY have come to bear in the form of a debut single, Sentir, a song that sheds light on the album that Geraldine and Dan are currently working on. "Sentir" means ‘feeling’, as in feeling emotions; feeling one’s skin, heartbeat, etc. It’s got a disco feel to it. It’s a seductive track, evoking a classic, yet contemporary sophistication reminiscent of the likes of Françoise Hardy, Francoiz Breut, Air and Moloko, with French verses complemented by a chorus in English.